Welcome to the Website of the “Curry Baude“, the Sausage Snack Bar located at the historic entrance of the Berlin-Wedding Underground Station 'Gesundbrunnen'. 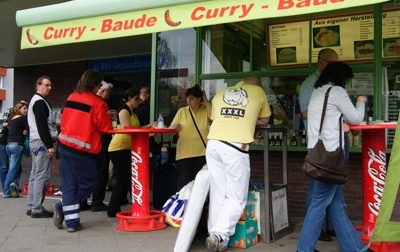 The traditional “Curry Baude“ has been managed by Reina Lehmann ever since the wall came down in 1989. 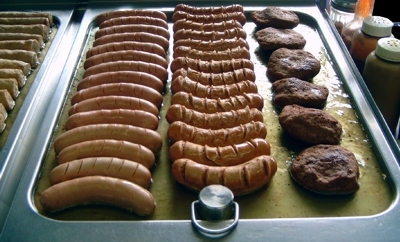 As a butcher trained by high German standards, he offers to his customers sausages made according to recipes of his making. Even his ketchup sauce is his own creation and draws from family secrets. 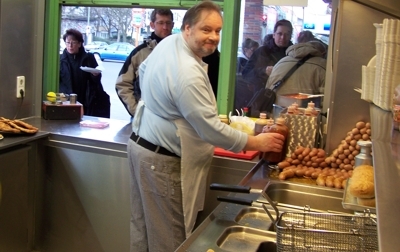 So, should you be interested in eating a true 'Berliner Curry Wurst' (Berlin Curry Sausage), then do not miss to see us at the “Curry Baude“..